If you’ve ever embarked upon the confusing journey that is selecting a pram, you may recognise the pain of overwhelming choice and the crippling indecision that follows. Upon starting the search, Google spurts back a list of brands whose names seem to have been dreamed up by babies themselves, while the prams look more futuristic and complex than a Mars Rover. Luckily, we’ve found a brand that makes it all a bit easier. We discovered an Australian brand with a beautiful aesthetic and a primary focus on safety and practicality. Cue Redsbaby! 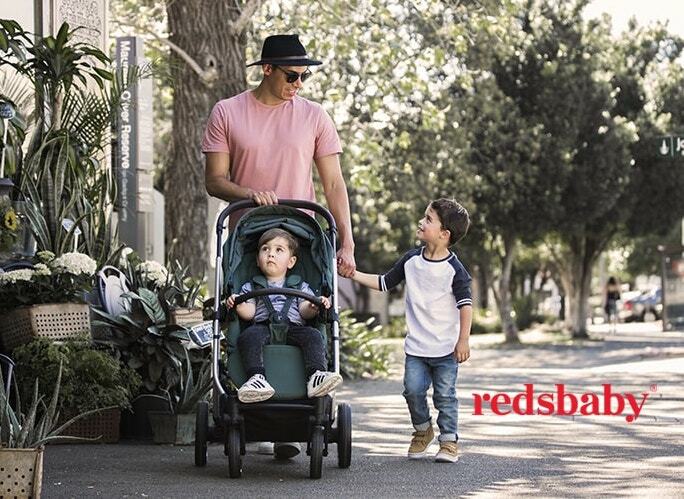 Co-Founder and Head of Design at Redsbaby, Meagan Redelman, says that the most important starting point for the design of Redsbaby prams was understanding what parents wanted from a pram. Parents wants safety, practicality and something that makes life easier for them. One of our favourite things about this Redsbaby pram is that it’s totally practical and portable. Yes, those futuristic prams look swish, but BOY are they embarrassing when you’re trying to load said pram into the car and you’ve been stuck in the middle of your street for half an hour because you can’t disassemble it and your baby is crying and then you start crying.. and major mummy meltdown ensues. The Redsbaby Bounce is kind of a jack-of-all-trades workhorse. It delivers the perfect combination of functionality, style and unsurpassed safety day-in, day-out. Have you tried a Redsbaby pram? Or do you have any favourites? Let us know in the comments! And the best bit is it all folds up into this neat little package!